Edit: Special thanks to NintendoMan for tracking down the identity of the unknown artist. The artist is Travis Pitts and you can find more of his work at http://zom-bot.com/! I'm warning you now, this post isn't strictly movie related. It is, however, highly relevant to my interests. Allow me to paint the scene for you. There I was late one night, browsing several dubious alleyways on the world wide webzors. Despite being in a bad part of town, I was minding my own business, trying not to look out of place. And that was when it found me. Helpless and alone, it descended upon me with a fury unknown to those who have not survived it. I speak, of course, of gaining a glimpse of the following picture. That title is what the file was saved as. The actual title of the work, I do not know. I also humbly do not know the identity of the insanely awesome artist whom has rendered the greatest piece of art post Da Vinci's Last Supper. If anyone out there knows, please drop me a line so I may give the artist proper credit. Let's dissect this bad boy for a moment. My eyes are naturally drawn to the large, imposing dinosaur in the image's foreground. I suspect this is largely owing to that fact that I was once a 12 year old boy. I'm not sure if it's supposed to be a Velociraptor or a Baby T-Rex, but either way he is as menacing as a cracked out Hamburgler at Mayor McCheese's inauguration ceremony. The topper, of course, is that this is not just any sort of dinosaur wrecking havoc freely in a city, no. No, this carnivorous rapscallion is a mount. His rider? DRACULA. I wish I could say the awesomeness ends here, but it doesn't. We're just beginning. This Dinosaur-General Dracula not only commands the velociraptor upon which he is perched, oh no. He is also commander-in-chief of a massive invading undead zombie horde. If you thought mindless zombies were bad, wait till you see them under the ruthless command of The Count. The invading armies do not end here. You, of course, have already noticed the UFO's raining chaos and destruction down upon the hapless city by way of their awesome death rays. Providing further air support are the darkened silhouettes of countless pterodactyles, which one must envision swooping down upon the clueless city dwellers, whom are no doubt rushing blindly into the streets as the aliens take down building after building with their advanced weapons technology. If you look carefully you'll see that the pterodactyles have not been merely mindlessly unleashed. They are, in fact, mounts themselves. At first I thought that perhaps Commander Dracula had outfited these flying death machines with members of his zombie horde, but closer inspection reveals the presence of capes, no doubt implying that these flying riders of doom are in fact vampires! Congratulations, nameless artist. I have no idea if your title for this work was originally intended to be 'Worst Case Scenario' but truly this has been realized. I've seen a lot of really bad movies. I've envisioned countless more bad movies that I wish would be made. None of the scenarios in my wildest dreams have ever even approached this awesome vision of unholy destruction. 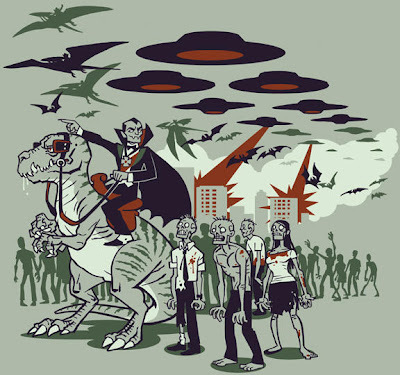 God bless Dinosaur-Commander Dracula and his invading hordes. How random that I came across your site. (Via your Comment on Matts XE Blog). And yes. That picture is awesome. I did some research and found the artist for it. Apparently it also comes on a shirt. Thanks a lot! Appreciate it! I may have to look into getting that shirt. thanks for the love of the illustration- you tell the story wonderfully- make sure you remember it so you can pass it on to the survivors of the dino-vampiric-undead-alien backed apocalypse. the title of the shirt is 'this is how the world ends', designed for threadless under a subcontest for hellogoodbye's album dinosaurs, zombies, aliens, vampires! (or something like that) so while i can't be responsible for lumping those four things together, i like to think i tried well to make them WORK together. it sometimes gets reprinted at threadless, but i wish they would make it a halloween season staple.